Enjoy sprawling views of the valley’s vines and surrounding hilltops. In just minutes explore the beaches, downtown San Luis Obispo, local wineries – or come on over and hang out with us next door anytime. All you have to do is pack your bag – we’re happy to take care of the rest. Our Estate Manager will gladly arrange transportation, make sure you get picked up at the local airstrip, have essentials waiting for you when you arrive, recommend where to eat and what to see, and make reservations. With unobstructed views of the valley, lots of lush outdoor space to stretch out on, and plenty of Central Coast sunshine, the Vineyard House is offers up endless possibilities for your next event. Get in touch and we’ll make it all come together. Please note: WE DO NOT ADVERTISE THIS PROPERTY ON CRAIGSLIST. If you see this property on Craigslist it is a fraudulent listing. Make our place your home for the weekend or longer. 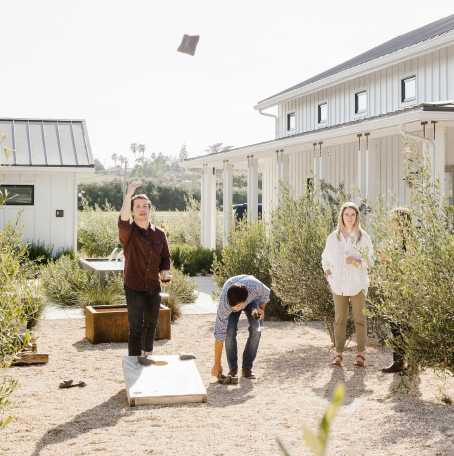 Tucked into 17-acres of Chardonnay vines, the Biddle Ranch Vineyard House is perfect for weddings, family gatherings, a friendly wine tasting getaway, or corporate retreats. Located right next door to our estate Tasting Room, within its walls is a gracious world of privacy, elegance, and down-to-earth charm. A mix of rustic, mid-century modern, and contemporary design and decor, the Vineyard House is spacious (just over 3,100 square feet) and can comfortably accommodate up to twelve guests.